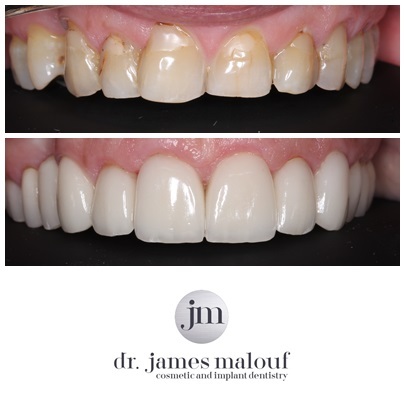 Leading Porcelain Veneers dentist in Brisbane, Dr. James Malouf is an expert in designing smile makeovers using dental veneers improving and transforming his patients’ smile. More and more of Dr. Malouf’s patients are turning to porcelain veneers due to their high quality and durability creating a natural looking smile. Porcelain veneers ( a type of dental veneer) are thin, custom-made, tooth-shaped pieces of porcelain that are directly bonded to the front and biting edges of teeth to create a beautiful, natural smile. Brisbane Cosmetic Dentist, Dr. James Malouf has been crafting and placing porcelain veneers for a great number of his patients for well over 10 years. With his advanced training in dental veneers and cosmetic dental procedures Dr. Malouf is renowned and sought after as a leading cosmetic dentist in Brisbane for these treatments. In just one short week, using smile design and providing a smile makeover using dental veneers, Dr. Malouf can give you a smile that looks naturally beautiful, symmetrical, white and perfectly fitted to your facial features. 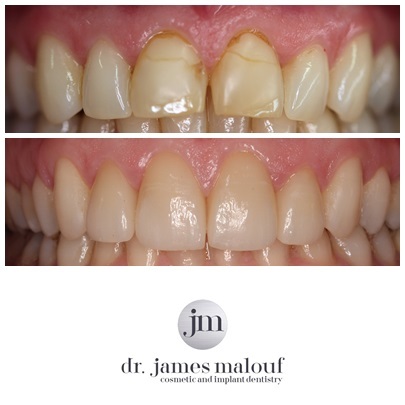 Dr. James Malouf takes great pride in helping people from all walks of life enhance their true beauty by restoring their teeth and smile, improving their confidence and giving them a good reason to smile more often. His attention to detail allows him to choose the perfect size and shape for each dental veneer. His work is always of high quality crafting amazing new smiles his patients have been dreaming about for years. The before and after photos of his many happy patients below clearly demonstrate why patients of all ages come to him for the best porcelain veneers Brisbane has available. If you are considering a smile makeover using porcelain veneers, then please contact Brisbane cosmetic dentist, Dr. James Malouf. The first step to improving your smile with porcelain veneers is to arrange an initial consultation. During this consultation, Dr. Malouf will be able to assess your teeth, oral health, your smile using a variety of diagnostic tools and will be able to provide you with a treatment plan. Dr. James Malouf, leading cosmetic dentist ascertains dental veneers can improve a smile greatly. In fact, more and more patients in Brisbane are turning to Porcelain veneers in comparison to other dental veneers options including composite veneers. Porcelain veneers are a dream come true for certain patients. Dr. James Malouf often sees patients who come to him to find out what can be done to correct a smile that has lost its luster over the years. Others come to him because they feel they have lost their confidence and competitive edge in their career or business due to cosmetic flaws in their smile. For further objective research,The Dental Guide of Australia also stipulates further benefits and costs for dental veneers. Dental veneers are custom made shells (porcelain veneers) or composite resin (composite veneers) placed over your teeth to improve dental functioning and facial aesthetics such as chips, gaps, stains, and misplaced teeth. The veneer materials are bonded to the front of the teeth to improve the colour, shape, size or length of the teeth and overall smile. Gaining popularity in cosmetic dentistry in Brisbane are porcelain veneers as this procedure causes little pain, significantly improves the appearance of smiles and can be completed in minimal time. Many patients are now considering the many confidence boosting benefits of updating their smiles and as a result are willing to pay for this treatment over a period of six to 12 months. Porcelain veneer costs vary from patient to patient as there are many factors that determine their price. James Malouf has taken the time to provide some porcelain veneer cost approximations based on some the cases he has recently completed. If you have any questions relating to these veneers cost scenarios, please contact our cosmetic dental practice, Malouf Dental. The practice also offers payment plans for major cosmetic dentistry work. Dr. James Malouf has outlined in the table below the fees associated with obtaining porcelain veneers in his Brisbane dental clinic. A part of his offering is smile design services as well as payment plans to help keep dental veneers affordable for his patients. How much do Porcelain Veneers Cost in Brisbane? Deciding to move forwards with porcelain veneers is a very straightforward procedure, yet so many patients are concerned about how long this procedure may take or how many times they are required to return to the dental clinic. Surprisingly, this procedure can involve as little as 2 – 3 visits. Dr. Malouf always recommends obtaining a dental checkup first to ensure there are no major complications that could delay getting porcelain veneers. The process begins with an initial consultation with Dr. James Malouf where diagnostic images and impressions are taken and the patient discusses their smile objectives. Dr. Malouf also takes this opportunity to correct other dental flaws or gum disease before dental veneers can be considered or planned for. During the next appointment, temporary veneers are placed in the patients mouth and the patient decides after a week or so if they would like any adjustments to their new smile. The permanent porcelain veneers are then bonded into place and the process is complete. No recovery time is required and there is little to no pain post procedure too. Porcelain veneers are strong and durable and mimic natural teeth closely and can reinforce and align the bite making the smile not only aesthetically beautiful, but functionally stronger too. 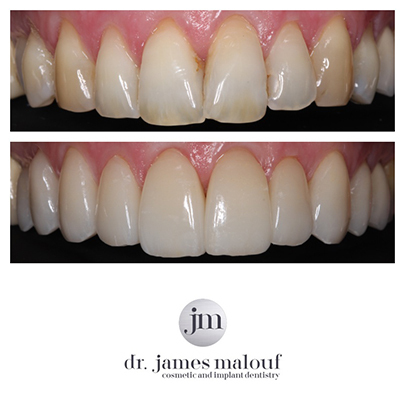 Dr. James Malouf has performed this dental veneers treatment in his Brisbane office many times and is considered a top cosmetic dentist fully up to date on all the latest technology and strategies for a new smile design.